My passion for photography is mainly in landscapes and being out and about in the middle of nowhere with fantastic light if I'm lucky. Growing up in the leafy suburbs in the northwest of England lent itself to my love of nature and my curiosity/passion for art and, especially, drawing. The more I immerse myself into my passion of photography, the more I feel that I missed out on some great photography whilst I spent my childhood in pictorial surroundings. Maybe this feeling has brought me closer to what I love doing… art, photography and being surrounded by nature whenever possible..
School days were miserable and a total drag. Not just the month of December, but my entire calendar used to look like an advent calendar counting down to whatever school break was closest. Half term, summer vacations, you name it and I bet you would find it marked in my calendar. Only difference was that there were no treats behind each crossed out date just the internal satisfaction that I was a day closer to the end of my school year. Looking back now, as you do, some of my best memories are from those school years when life was wonderful and carefree. Isn’t hindsight a wonderful thing? Academically though I did very well. I was part of the good old pre GCSE days of ‘O’ and ‘A’ levels, I attained good marks in the usual core subjects and needless to say art. The art side, however, slowly diminished after I left school. Envy for my zealous free-souled friends working and earning led me astray from what feel I should have continued. I later attended university where I attained my Degree in Business and Finance. It was only about 2 years ago that I picked up a pencil and paper and started to sketch again. I wish I had a story about how photography runs through my family, that photography was an innate reasoning or even that my grandfather gave me his broken down camera to play with which led me to learn more. My exposure was a little less intricate, it was more curiosity that sparked an interest in me. My earliest memory of inquisitorialness was seeing a Pentax 35mm camera slung round the neck of my Art teacher. I think that was the defining moment that I started to wonder about photography and that aspect of artist ‘representation’. It took a while for me to warm up to the idea and consequently I didn’t buy my own film camera till I was in my mid 20's. In my opinion, in the days when digital photography didn’t exist and film was the fore, ‘the craft of taking and developing an image’ was, to me, a lot more personal and a unique experience. I think getting as far as I have, is a personal moment of pride for me. Photography has, also, changed me for the better. I feel I am more patient, more appreciative, outgoing, active and to a degree a lot more social! Of course, getting feedback from friends and family alike is great, but more so the honest feedback you receive from random strangers who come across your work via Flickr or my website is something I hold dear to myself. So, what is my proudest moment in photography? Nothing to tweet about so far, but I am certainly proud of my journey from seeing the Pentax 35mm to having my own website where I display my work. It was the first time I saw the swishing chemicals doing their magic and the development of an image appearing on the paper. This was true ‘magic’ and that moment has always stuck with me. My first ‘epiphanic' moment happened whilst on my HNC photography course seeing a black and white image that I had taken slowly appear in a tray of chemicals in a dark red lit room before my eyes. It was the first time I saw the swishing chemicals doing their magic and the development of an image appearing on the paper. This was true ‘magic’ and that moment has always stuck with me. I think this part of photography (since changing to digital) is something I will always miss. I don’t think most people under the age of 30 (unless they are a bit artisan) have experienced this for themselves and this tactile approach to photography is something I am glad to have experienced. My second ‘epiphanic’ moment would take me back to May 2011 I guess with composing of the image “Volcanic View” . It was during my first visit to the Isle of Eigg. The geology is so breathtaking and surreal with every step you take on Eigg that you’re really spoilt for foreground interest which can sometimes overwhelm you. Initially, we thought the sunset would be an uninteresting one as we had clear blue skies all day. After a few hours scouting round for interesting foreground and of course Rum in the background I, eventually, settled for large pool of water that had formed in one of the many unusual rock formations. The light overhead reflected in the pool and contrasted wonderfully with the almost phosphorus greens of the seaweed lining the edges. Seeing this image of the lit landscape before me instantaneously appear on the back of the camera is something that convinced me that even though I miss the whole dark room process, I’m still glad I moved towards digital. It gave me the reassurance (unlike my past experiences with film) that I had captured the image I saw before me and in my mind’s eye (Volcanic view). I am not really a city person and love being in the outdoors, free from the hustle and bustle of city life. People pushing each other to save those extra few seconds to their destination, over-crowded trains, buses and all the materialistic things that come with living near a big city where I live in The Hague doesn’t phase me. What does move me is the beauty you would be engulfed in just a few miles out into the country side. Nature, the vastness of the sky, different shades of colours and textures the eye ingests, the realisation and reminder of how beautiful the landscape around us really is.. It's almost religious. So, it was a natural progression for me to combine my appreciation for nature and what I love doing most, hence landscape photography took the front seat. For me, landscape photography is the only kind which allows me to capture the magnificent light , forms and textures all around me in its natural state. The stage is already set, you just need to make the best of it. From the ground you stand upon, to the open vistas beyond, marvelling your surroundings, you will always see something which fascinates you and compels you to try to compose an image. For me, with landscape photography no two images of the same scene can ever be totally alike because of the ever changing light. I think this is what keeps my interest in photography and possibly revisiting certain favourite locations over and over again. It's unfortunate that in this life, the norm is that your passion rarely pays the bills and you have to conform to societal standards. Thus my job has nothing to do with my passion for photography and art. In fact, it’s almost on the other side of the spectrum… behind a computer screen, tapping away on a keyboard. The closest I get to nature with my day job is the view from outside the window . Making business and finance my major after school, I currently work as an Oracle Support Analyst for a large communications company near to Amsterdam in The Netherlands. The camera I currently use is a 5D MK2 with a 70-200mm, 17-40mm and 24-105mm lens. I have been using this camera for the last 4 years and am really happy with it. The image quality is excellent. I do, however, want to purchase a back-up camera, possibly a second Canon body as I'm always conscious of the camera falling over or that some freaky accident leaves me camera-less on a remote trip somewhere. All the lenses mentioned above are used on my trips. I, also, have a Hasselblad 501cm 6x6 film camera with 2 Zeiss lenses 50mm and an 80mm which I haven’t used in over 5 years now. I think I’ve kept it more out of sentimental reasons and just in case I feel the need to go back to film at some point. I am considering making use of the 50mm lens, in the meantime, by buying an adapter for my 5DM2. Also, a consideration would be to purchase Canon 24mm TSE, but it’s early days and I'm still chewing on the idea. I am leaning more towards getting an adapter, at this point, as the way to go so I can make use of the lenses I already have. My workflow is pretty simple really. My aim is to get as much of what I am trying to capture, in front of me, right in the camera first time. Also, I have a job in IT/Finance which means that 8 hours a day is spent behind a PC. So, I don’t want to be spending any more time behind a computer than I have to. I always shoot in Raw. Post processing I import my images on to my MacBook Pro and then into Lightroom 4. I go through all my images and immediately delete any duplicates or those with camera shake etc. Then I apply the basics such as dust removal, tone curve, clarity, saturation/vibrancy and after that I export as a high res jpeg. I used to also export as a tiff, but as I’m not printing my images at the moment it’s not worth it and it saves on space. Finally I back everything up on 2 external hard drives. I do have CS4 but rarely use it to be honest. A few friends and acquaintances have requested prints since I have gone digital and I have some black and white prints on the wall which I took and processed for myself from when I did my course in 2003. I used to own an excellent A3 printer but hardly ever used it. I think like many of us, I too fell prey to the ease and comfort of keeping my images in digital form. However, I cannot deny that having a tangible form of your own work is a lot more rewarding. For that reason, I am going to make it a small project this year to have some of my work printed professionally. I don’t think I will be investing in a new printer of my own as the amount I have printed over the years does not warrant buying one now. Plus, I want to learn more about printing (as it is an art form in itself) before buying one. In the meantime, there are some great services out there with an excellent reputation and will print a million times better than taking up the task on my own at the moment. Photography is such an open art form and so many people are doing it today with the accessibility that digital brings, but great and inspiring photography isn’t an everyday occurrence. They say “beauty is in the eye of the beholder” but there are certain things which surpass this notion. 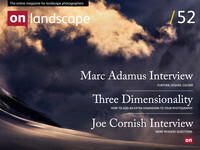 For me, Joe Cornish and David Ward’s work has been very moving and inspiring over the years. As of late, the same applies to Ian Cameron and Richard Childs. Recently I was fortunate enough to attend a workshop with Ian Cameron in the outer Hebrides. The workshop lasted just a week but he left me with tips and insight on a few things that have stuck with me since. How to ‘read’ light, the use of filters and the thought processes behind each image you take were just some of the insights he passed on. It goes to show that even after some years you can always learn new things and have a different perspective on your photography from listening to others. Goes without saying that the workshop was invaluable to me. If I was to pass some advice to newcomers, I would say never to pass up an opportunity to attend workshops. You never know what you will learn. For me, Joe Cornish and David Ward’s work has been very moving and inspiring over the years. As of late, the same applies to Ian Cameron and Richard Childs. When it comes to books on photography I have very few. I prefer to read photography magazines and National Geographic as they are easy to carry on the move whilst commuting to and from work. Not to mention that living in the Netherlands (my home away from home) due to the sheer size and volume of photography based books, it’s very hard to carry them with you. The few books I have purchased however, have had a significant influence on me. The first was Joe Cornish’s “First Light”. (You can tell why he was mentioned in the inspiration list earlier!). I remember my initial thoughts, turning each page and studying the wonderful detail and the beautiful light that Joe had captured in each image. It’s the only book I took with me to the Netherlands and still refer to from time to time and discover new things. Another book I am very fond of is “The Negative” by Ansel Adams. A must whilst doing my photography course and for anyone who wants to fathom the rudiments of the Zone System. I think even if you don’t master the zone system it is still important to have some grasp of how the camera gauges and interprets light . “Smooth and Simple” was taken on the Singing Sands in The Isle of Eigg in October 2011. It was a sunny day, cloudless with the light bouncing off everything in sight. I headed out in search of something different than the usual full vista of Rum in the distance. The Isle of Eigg is full of amazing geology and sometimes overwhelms you with the variety of subject matter to choose from. On this occasion I wanted to capture a more intimate and detailed image so luck brought me to look in the shadows beneath the small cliff at the back of the bay. There were lots of interesting and different rock formations to choose from because of the locality but these 2 rocks are what caught my eye jutting out of the pristine quartz sand. The composition and colour were exactly what I was looking for and hoped…Uncluttered! Another one of my favourites, “Out of the Mist” taken early 2011. The location was the Isle of Skye. I was on a week’s holiday at the time and decided to have a look at the bay, to the far left of the usual Elgol area, of this iconic part of Skye. The wind was blowing strongly and the ghostlike Cullins began to emerge from the misty, heavy clouds rolling in towards me pelting me face on with rain. It was a bit of a struggle between gusts to wipe filters and take a shot that didn’t have camera shake. My aim was to capture the essence of why the island is known as the ‘Misty Isle’ and the agreeing weather made that possible. In my view, this image describes it perfectly. “A Break” is another mean and mood image from the Isle of Skye. This was taken on my very first visit to Quiraing. I was totally overwhelmed by the sheer, raw beauty and size of the landscape all around me. The wind, unsurprisingly, was again blowing a gale but I was dry at least this time. The clouds were rolling over head and just at the right moment a break appeared in them allowing the last of the late afternoon sun to penetrate through briefly. I was amazed at the spotlight of light that illuminated the peak perfectly in front of me. I managed to take 4 shots before the clouds closed over and the sun disappeared for good. Luckily 3 out of the 4 images were without camera shake. You never forget your first love. For me that was drawing. As I mentioned earlier, I have never been a city person! I love to get out and about. Even though I live on the edge of The Hague in the Netherlands, whenever I travel back to the UK I always head out to some remote part to walk and enjoy the great outdoors. Photography has given me a reason to travel around the world. So, maybe I’d get out in the landscape and combine walking along with doing sketches. I intend to start a part-time degree course in Fine Art which, I think, will take me at least 3 years to attain. During this time it will allow me to develop further, artistically, as a photographer too. Some people don’t see photography as a form of art in this country, but to me, I’ve never thought of it as anything else but that. That’s a very difficult question having mentioned all the photographers I am in awe of. However, I have to say Hugh Milsom would definitely be in my favourites. I really enjoy his work, especially his almost impressionistic style Hebridian images. Also, Anita Nichols and Harshan Gill, 2 friends whose work of their local stomping grounds of Northumberland and The Peak District, I admire. Last but, most certainly, not the least the wonderful work of Ian Cameron. The way he composes and captures the transient light in the landscape, wherever he may be, is inspirational.